I havent had much chance to get out for a bit it so i made the most of it by hitting the river first light hoping to bump into a slab feeding on the sherry spinners from the previous day. Well that’s what i was hoping on. There were a few around but nothing on the fin so the french leader was set up on my greys 10 ft with around 6 ft of stroft ABR to the point fly ( 2.8m Hares ear) and on the dropper ( 2m PT flash back around 20″ from there. The water level is so low at the moment and the river is on its bones and in a few places the weed has been exposed so bad that all you can see is weed and no water. Its made a few good places really hard to fish. Hitting the back-end of the run fishing the opposite side of the fast water i made a few short casts into the fast water to see if they were in the flow and letting the nymphs come round me and bringing them back up in the water column with a few short jerks to see if i could induce a take, after a few tries i managed to take one brownie. After moving on up the run a little further i started to fish the slack water amongst a few submerged boulders where i have had a few monsters in the past. But nothing this time. 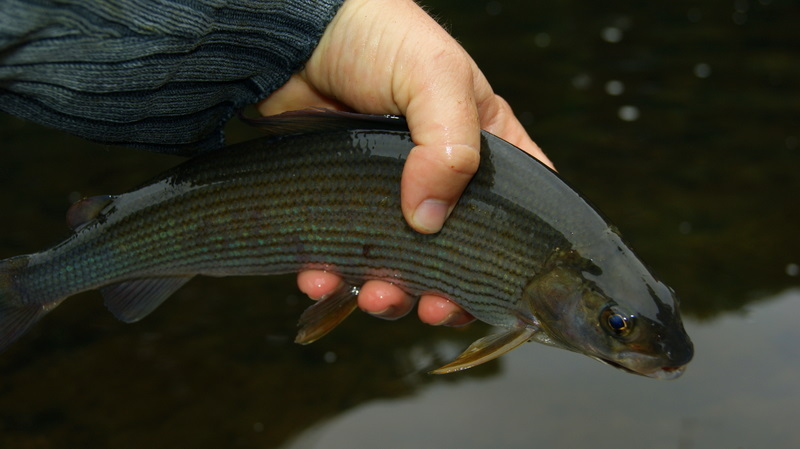 This entry was posted in River Taff and tagged fishing, fly fishing, french leader, grayling, river taff, trout on July 24, 2011 by fishstalker666. 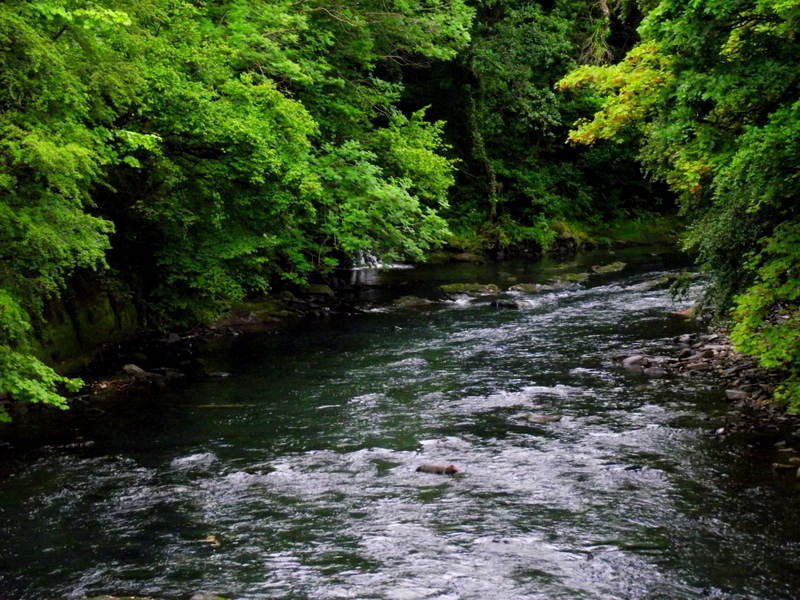 As its friday i finish early from work and had the chance to fish the Rhondda for just a few short hours. Its been a long week and i just had to get my fix, I was counting down the hours so i get in the car and get home as soon as i could. No messing around, i had all my gear ready by the front door and it was on in no time at all and i was on my way. I was on the river for around 1.30 . As norm i had my both rods with me, my 10ft 3wt for the french leader and my 8ft 4 wt for the dry, i was all set up ready for action. 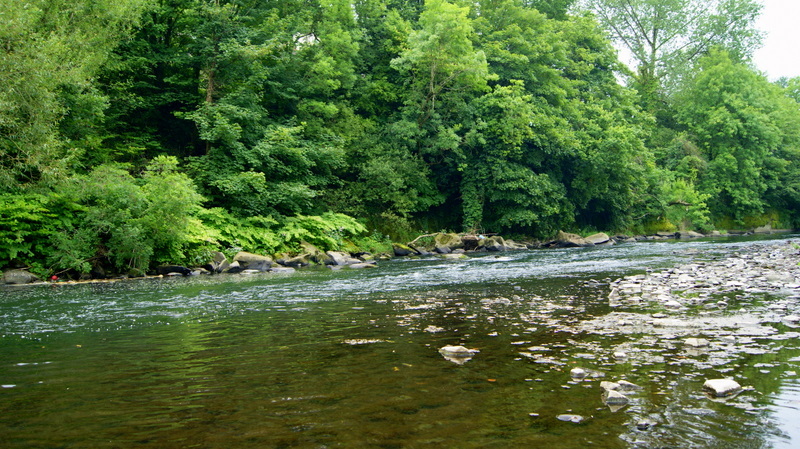 Before i set off, i had a quick look on the taff where the Rhondda meets and did see a few flies on and a few small fish rising so it was looking good. 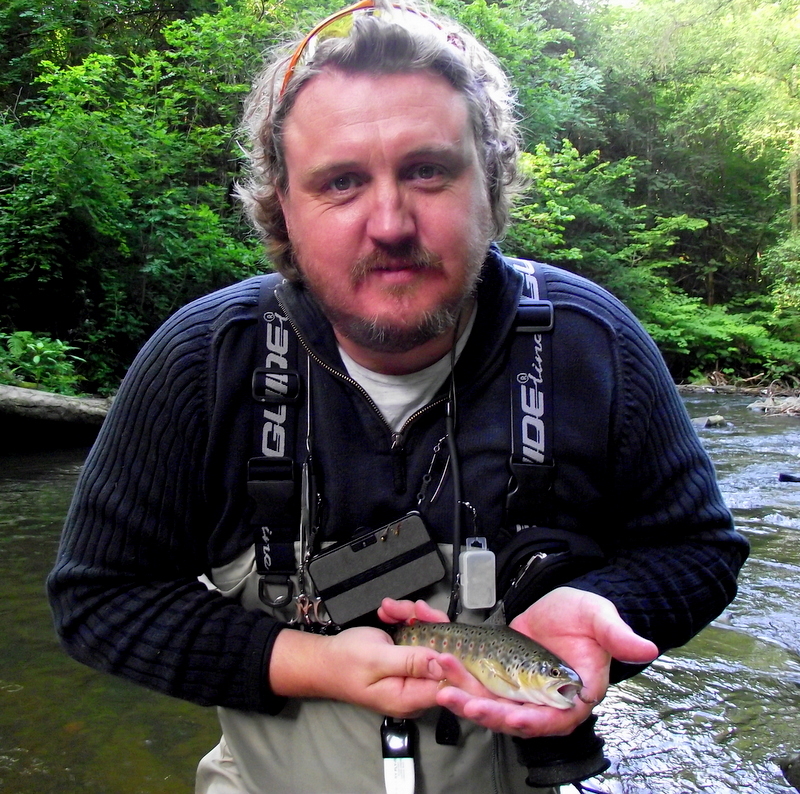 As i moved on up the Rhondda i could see a few blue wing olives on the water and a few sedges but i didn’t really go for the dry rod straight away. 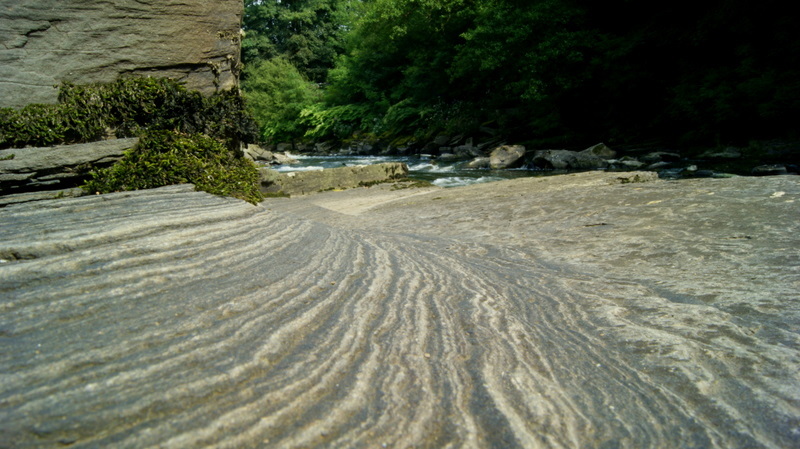 The lower parts of the Rhondda is mostly pocket water with not a lot of slow water so it was down to the french leader. 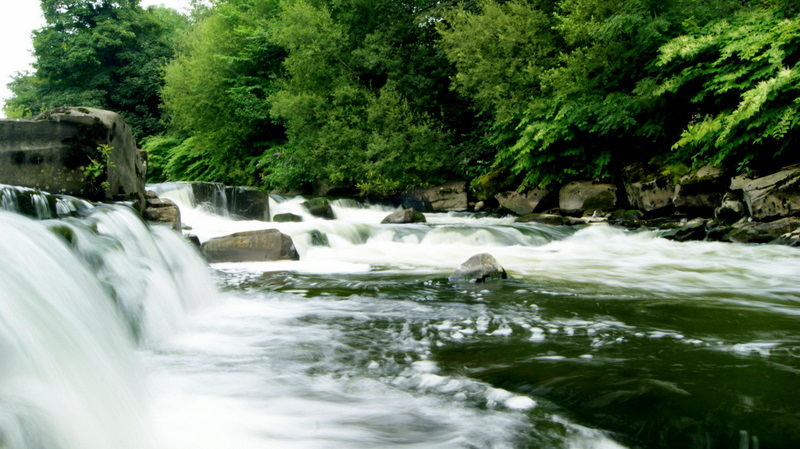 The water was very clear and low so i knew that i had to take my time and stay low and utilise the long leader. I set my video cam up and moved into position and made a few casts and pretty much straight away i was into my first fish of the day. Not a bad start. As i moved up under a bridge a rise caught my eye so quickly changing over rods and i slowly made my way to a spot where i could get a cast in. As i moved on i seen a few more rising picking off the olives at the head of the pool so i kept low and made the cast. This was the pool that i was working my way up and where i done the videos. After playing around with the videos and catching a few more lovely trout i had the phone call telling me, come on its time to come home 😦 I didn’t fancy being in the dog house again so i made my way. It was a cracking few hours out and i really enjoyed it. I’ll leave you with this last video of my outing. 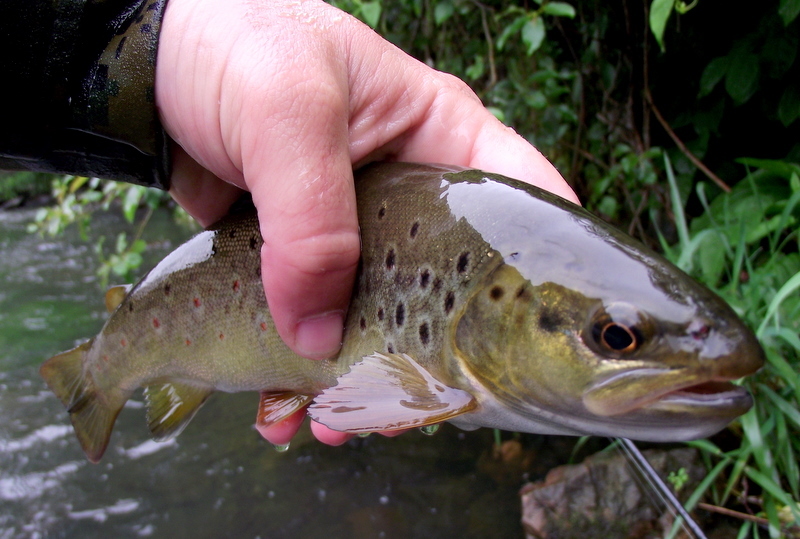 This trout give me a cracking take and put up a good fight. 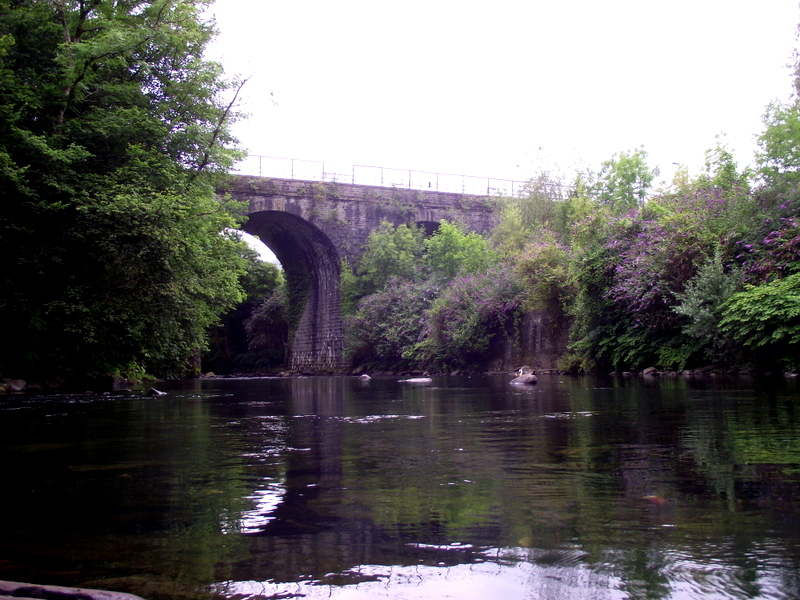 This entry was posted in River Rhondda, Video and tagged french leader, nymphs, Rhondda, south wales, Terry Bromwell on July 15, 2011 by fishstalker666. 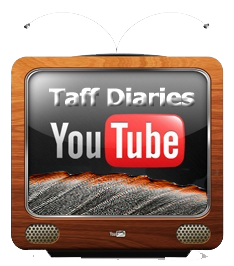 I found myself planning a trip to the clydach with a bunch of friends this weekend,Ceri Sweeny, Toby Jefferies and Nicholas Steedman. 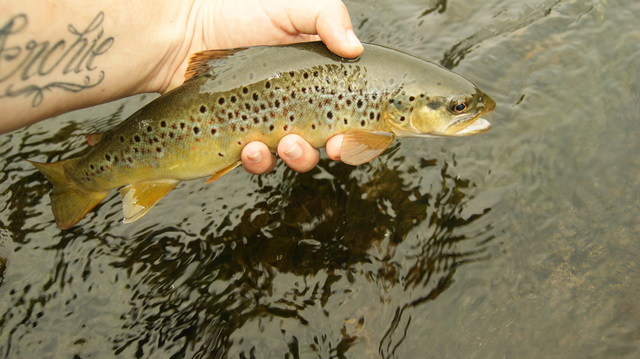 Due to the weather we been having here in south wales it was the only chance to wet a line in the stream, all the rivers in the area where all in flood and just unfishable. I blame Toby, Storm bringer as i call him, every time he even thinks of coming over into wales the clouds open up and all hell breaks loose ;). 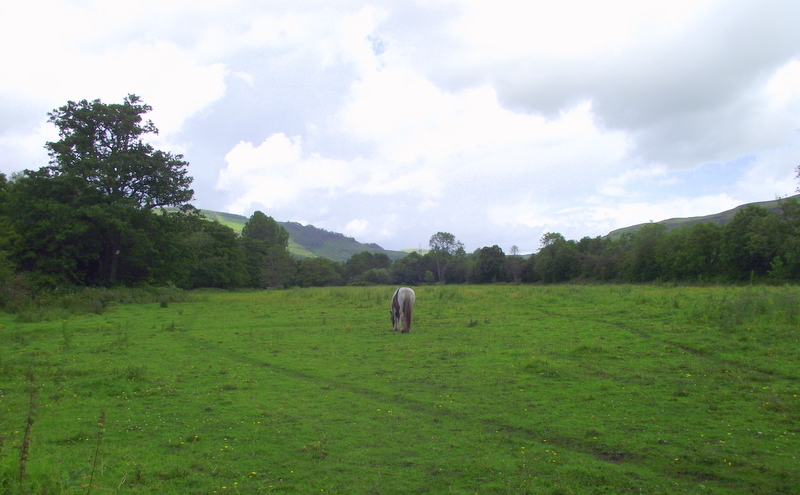 The day started out outside my home where we all met at 9am and after a chat we made a move to the clydach, It wasnt the best of mornings with heavy cloud cover and the threat of rain looming. After a short drive ,we arrived at the clydach and me and Nicholas went down the bank to see how it was running, but before we even got there we could hear the stream raging in the valley. It must have been the highest ive ever seen it and was running with heavy colour but it didn’t stop us giving it a going over. Due to the condition with high colour and raging water it was all down to the klink and dink. High bright pink post klink and a Hares ear red tag . As there was four of us we split up, me and Ceri headed up river a few hundred yards away from the other boys so it wasnt so crowded. 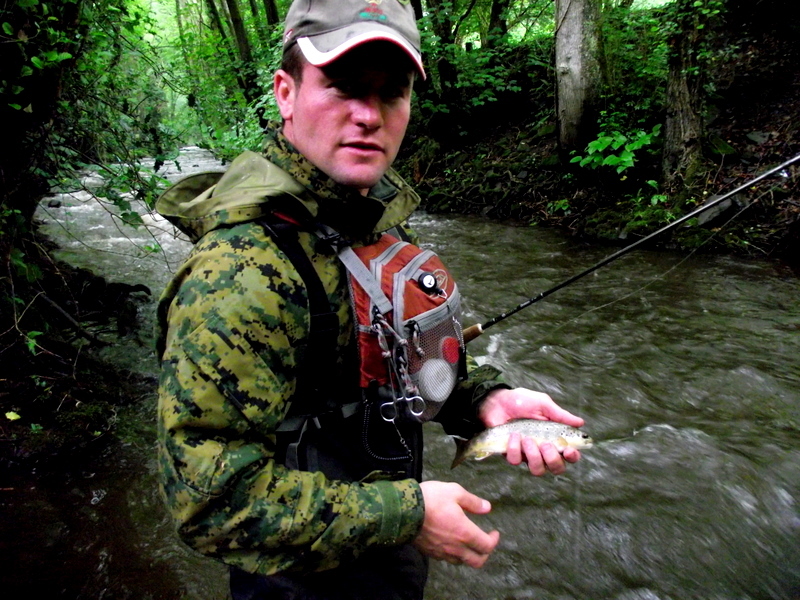 Ceri was the first to step in and in no time at all he was into his first fish of the morning. 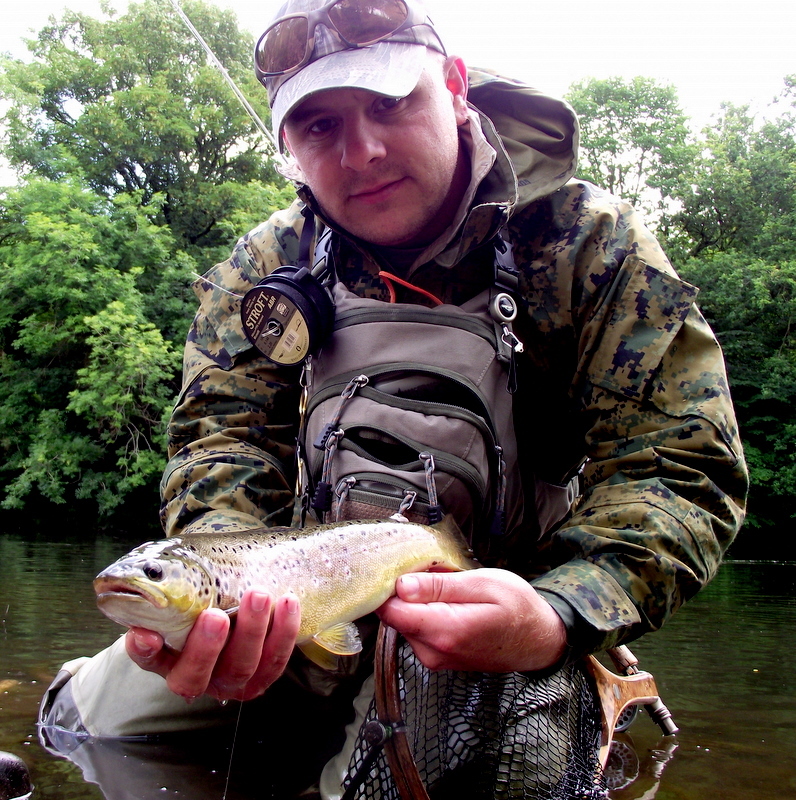 Ceri Sweeney quickly bringing a wild browny to hand in no time at all below. 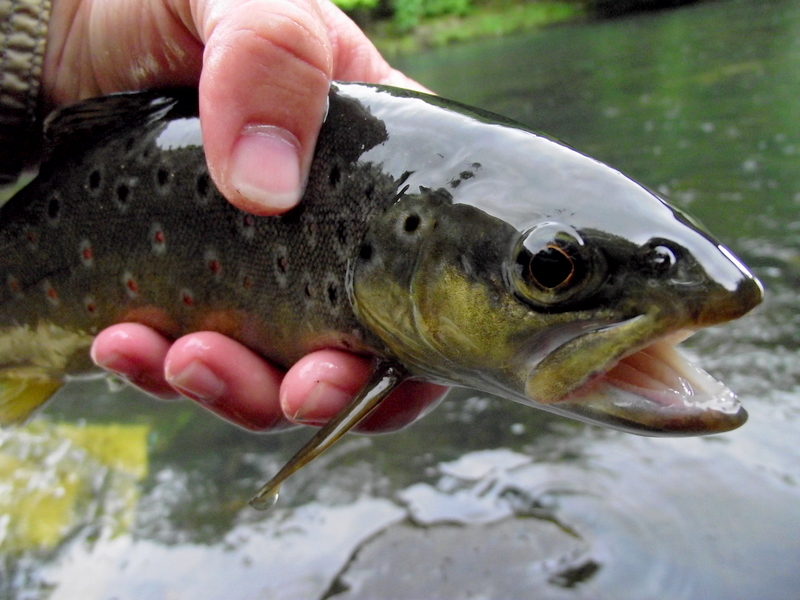 As we moved on up stream fishing the back ends of the runs and pools going fish for fish we were quickly getting into good numbers and some lovely looking wild trout. With the water pushing it made the fight so much better and on a few occasions we had to give chase down river a few yards when hooking into a better size fish. After a while, i gave Nicholas a ring to see how things were going down stream and after a quick chat ,Nic was on his way up and from there we all stuck together and all took turns fishing each run and pool we come across. 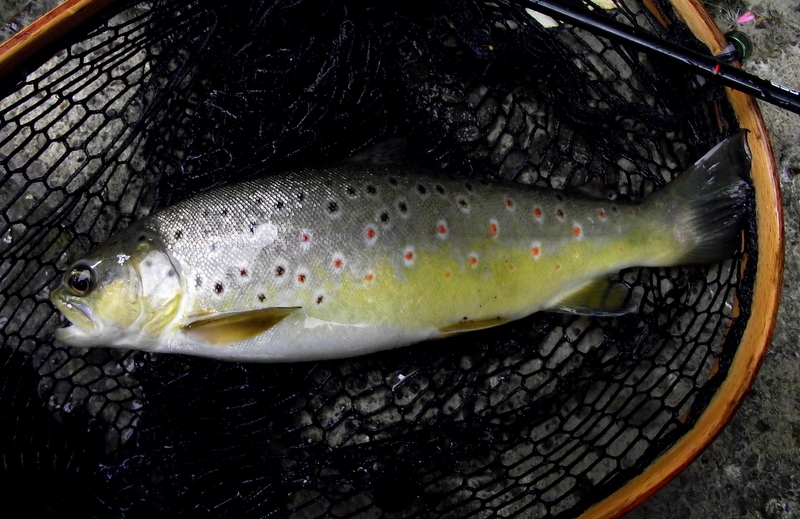 I have to say it was Nicholas’s first visit to the stream and fair play he was doing really well with a good number of trout to hand and some really fine looking trout too. It was a pleasure fishing with him again and by the looks on his face i think he really enjoyed the day. 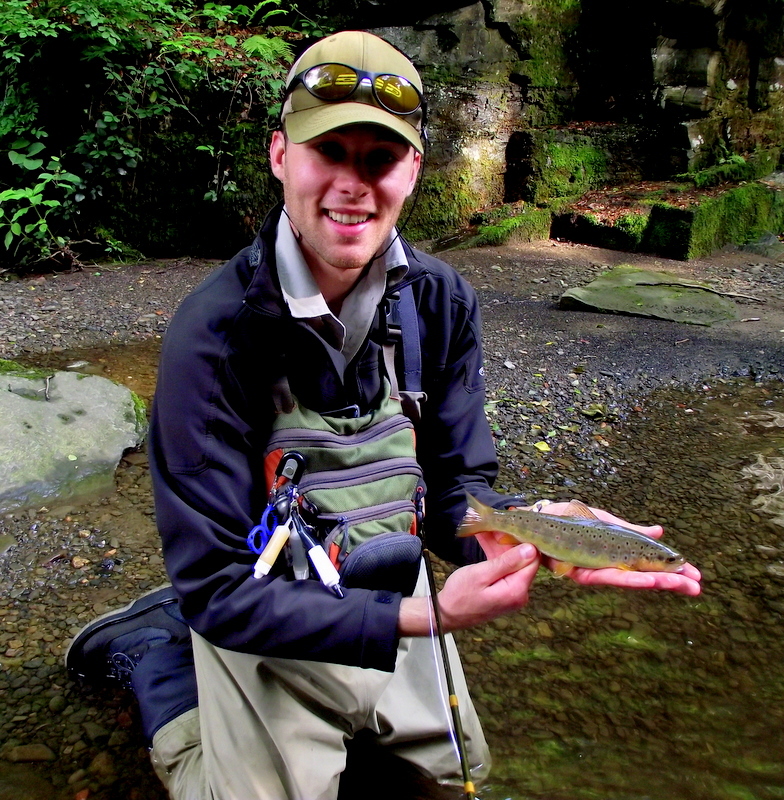 Nicholas below with a fine stream trout. As the day went on the rain decided to put an appearance in giving us all a good dowsing but it didnt dampen the spirts.We took this opportunity to have a break in the cover of the trees and have a bite to eat and a chat. After just a short time the rain stopped and we commenced fishing. 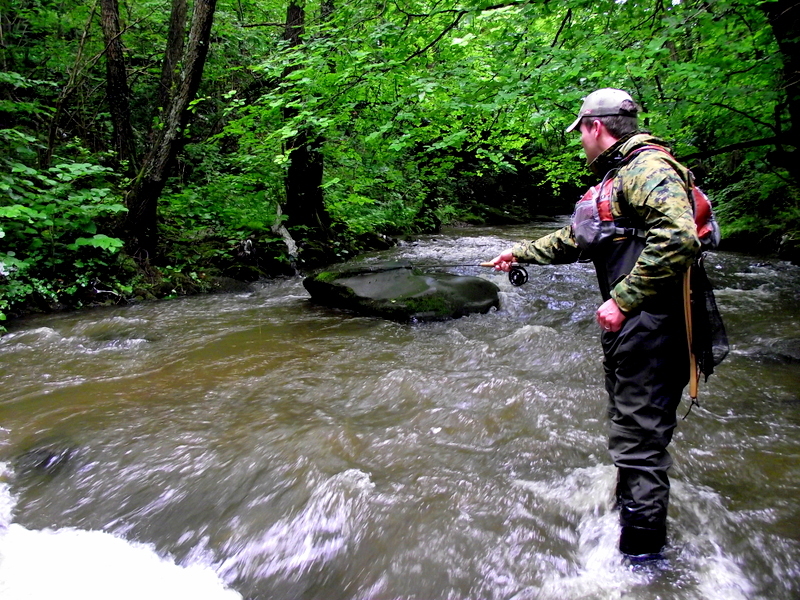 Immeadiatly, we were all back in the zone as i call it, catching trout in the back end of the runs and along side the fast water. I don’t think it could have got any better the fishing or the company. We come up on one run and Nicholas was kind enough to take a short video of me using the klink and dink with a little success. As we all moved up stream we started to fish water i have never fished and i have to say it was just perfect. It was a little tighter than the lower waters but made good fishing and tested the casting skills. 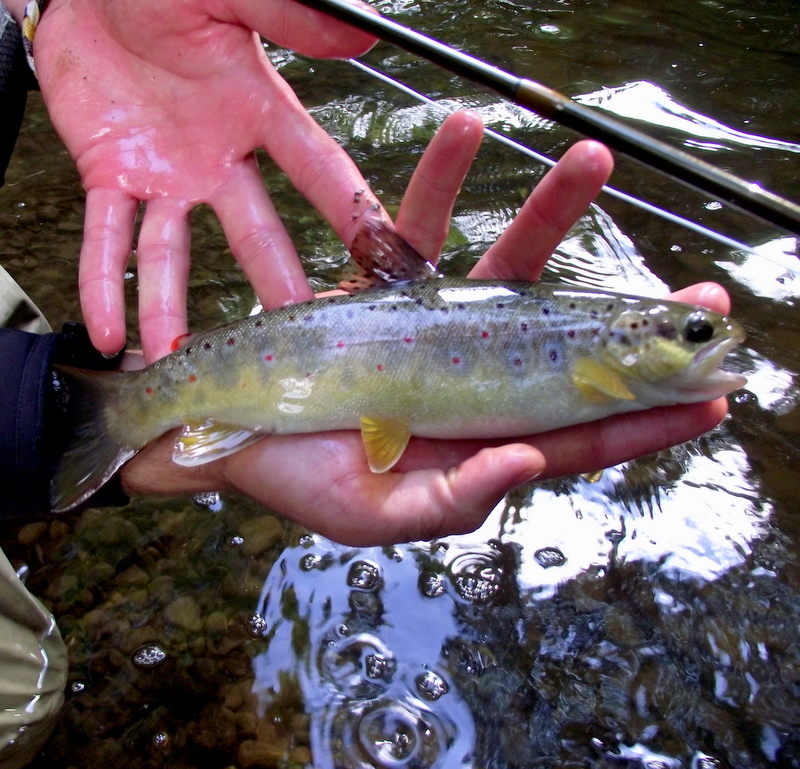 By this time the stream started to drop and clear up a little so Toby and myself set up the dry and give it a whirl. We did have a few fast takes but nothing really was interested for some reason. Maybe they were just hooked on the nymphs because of the flood water, i don’t know. So back on the nymphs and back into the fish straight away. We all had many more fish to hand but time was flying at this point and due to the long walk back and the drive back for Toby and Nicholas it was that time to leave. It was a cracking day out and i enjoyed the company and the fishing was just outstanding. What more can you want. 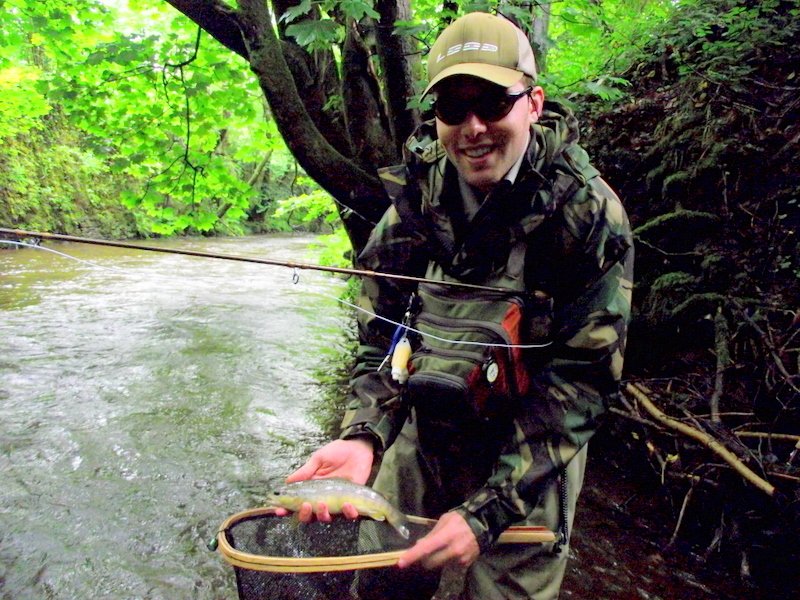 Toby below with a fine trout. 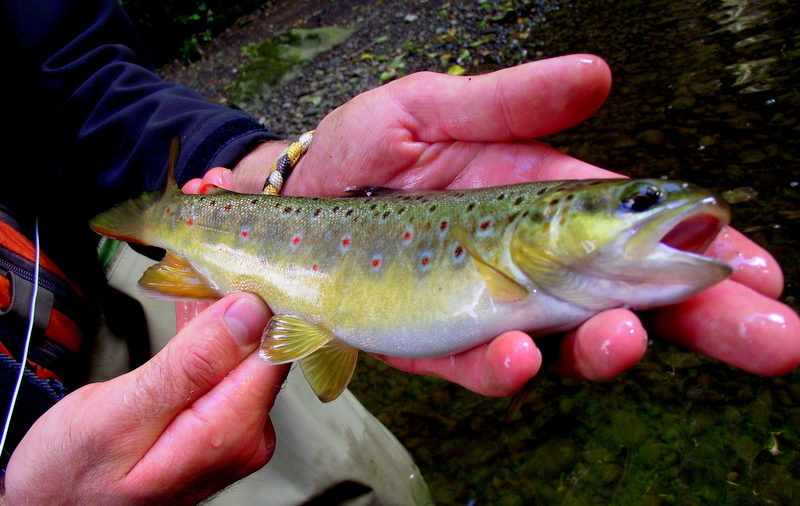 I just love looking at these colours on these wild stream trout, just beautiful. 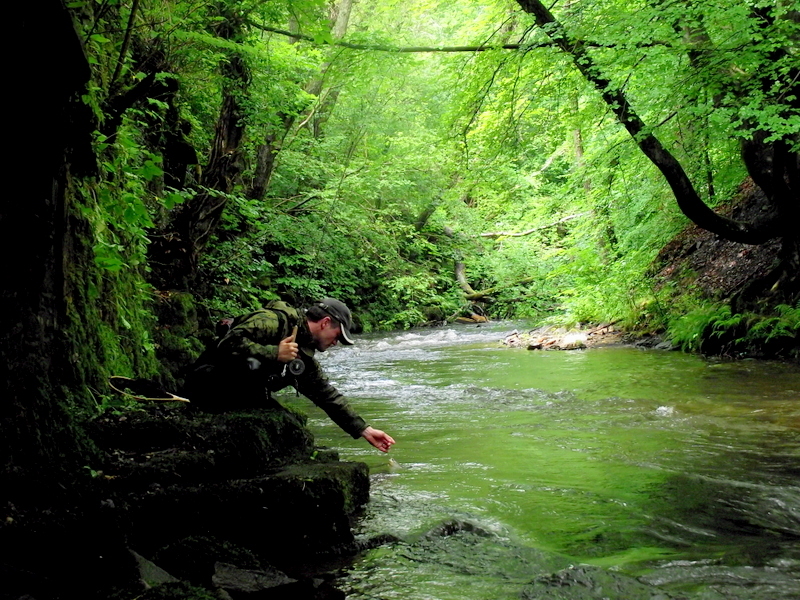 This entry was posted in River Clydach, Video and tagged fly fishing, nymphs, south wales, stream fishing on July 10, 2011 by fishstalker666. 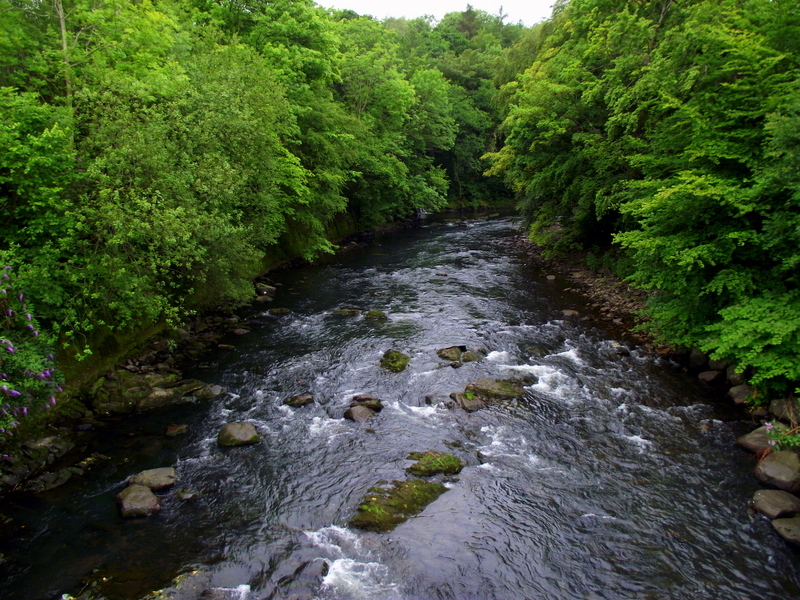 As i opened my eyes at 6am to find the alarm to throw it at the window, i realised if i did, the taff would have been flowing through my house! The rain was bouncing off the window making hell of racket. So i headed out of the house about 6:30 to head towards the middle of the Taff.. Thinking it was a bad idea. As i hit the river i set up my two rods, one on the dry and one on the french leader.. On the french leader rod i set a 6 ft leader up about 18 inches between the flies. My plan was to set up with 2 2mm tungsten bead jigs to fish the back ends of the runs, and then work my way to the faster water at the head of the pools altering the weight of the flies. Managed to take a few fish while i was working my way up, towards the sides of the runs, as the water was going up the fish seemed to have pushed to the edges out of the main flow. 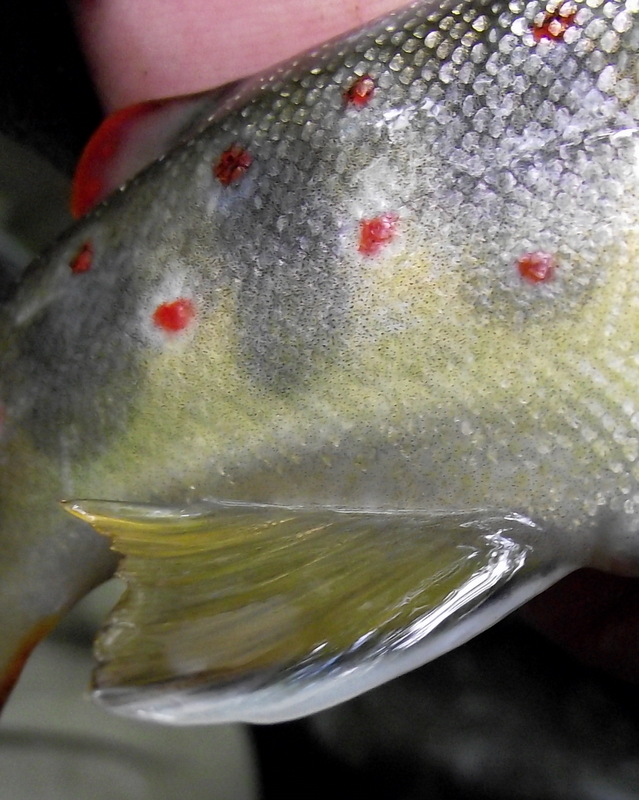 Some fish were seen jumping and moving but nothing really as there wasnt a great hatch of flies on. I wasnt out that long but well worth it with well into double fingers to hand, not bad really considering the conditions. 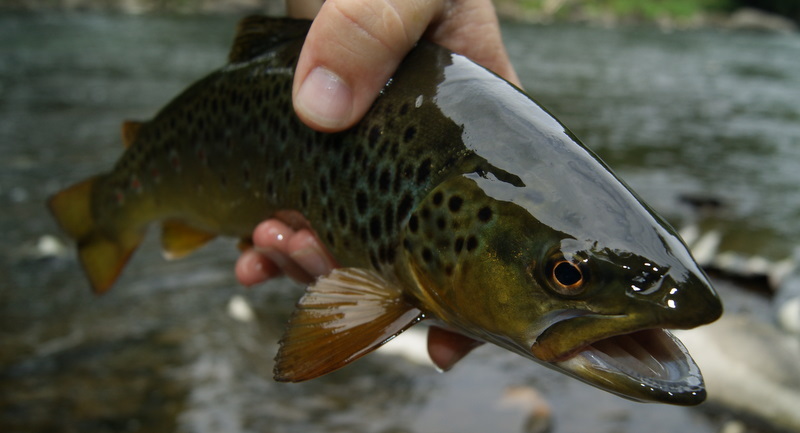 This entry was posted in River Taff, Video and tagged flyfishing, french leader, south wales, trout on July 6, 2011 by fishstalker666.